THEMIS Image of the Day, January 22, 2019. This VIS image shows part of the eastern end of Candor Chasma. The upper edge of the canyon is at the bottom of the image. 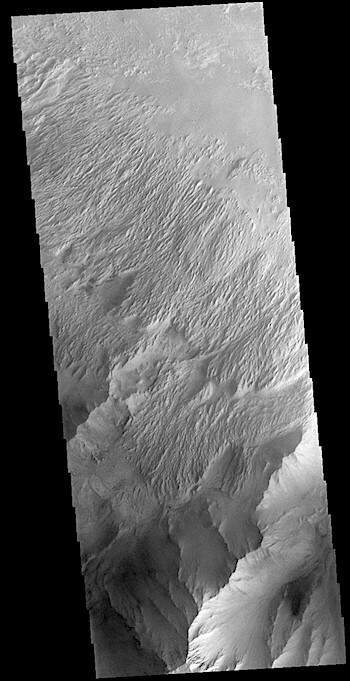 The slopes of the chasma are eroded into a series of ridges and valleys. Winnowing of unconsolidated sediments by long term unidirectional winds can create these features. The ridges and valleys are called yardangs. This entry was posted in Reports and tagged Arizona State University, ASU, Candor Chasma, Mars Odyssey, NASA, THEMIS, THEMIS Image of the Day, Thermal Emission Imaging System, wind erosion, yardangs. Bookmark the permalink.